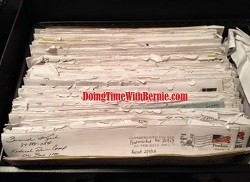 DoingTimeWithBernie.com: Felon on Probation Bernard Kerik doing the Okie Doke thinks he's still the NYPD Commissioner and its damn scary! Felon on Probation Bernard Kerik doing the Okie Doke thinks he's still the NYPD Commissioner and its damn scary! Felon on Probation Bernard Kerik doing the Okie Doke thinks he's still the NYPD Commissioner and it's damn scary! There is no shame in felon Bernard Kerik's game when it comes to his humble brags posted with intention to rehab his libel-proof felon crumbling image. 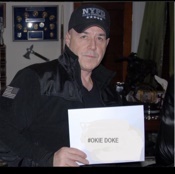 Source Instagram Bernard Kerik Felon on Probation Bernard Kerik doing the Okie Doke thinks he's still the NYPD Commissioner and its damn scary! Kerik's stated intention was to honor ailing cancer kid #DStrong Dorian Murray, but, as usual, the pic was all about felon Bernie Kerik. An eight-time convicted felon currently serving United States Federal Probation should NOT be allowed the privilege to wear the cap of a five start Commissioner. Kerik has shamed the NYPD with his corruption, lies and deceit! On a more honest note, www.DoingTimeWithBernie.com wishes Dorian Murray all the best, including our prayers for you and your family on this day, #DStrong Day in Rhode Island, around the World and right here on www.DoingTimeWithBernie.com! It's about you, Dorian, and your picture should be seen because your are now officially famous, Dorian!!!! Wheeeee! From prison, felon Bernard Kerik mentions little Dorian. 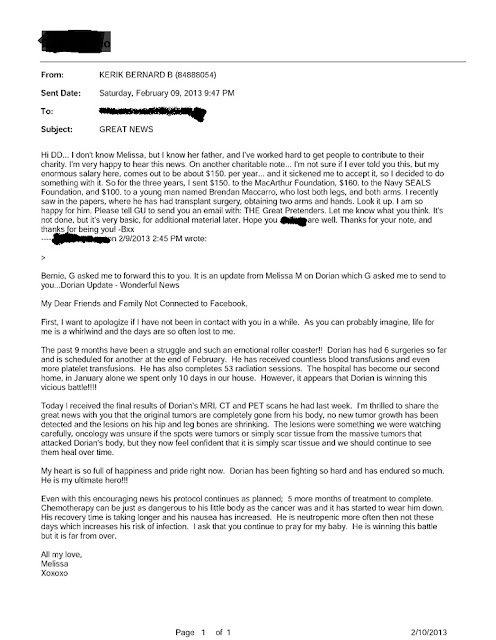 In 2013, buried in this selfish missive sent from FPC Cumberland, MD US Federal prison by then inmate Bernard Kerik #84888-054, documents how much he's done for charity from inside his prison walls. It never stops. It's always all about Kerik! Source: www.DoingTimeWithBernie.com archives Bernard Kerik prison letters from Cumberland Felon on Probation Bernard Kerik doing the Okie Doke thinks he's still the NYPD Commissioner and its damn scary! 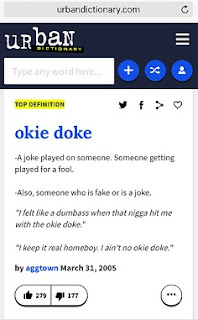 Felon Bernard Kerik's masquerade of being a trusted law enforcement source and unselfish human being, my friends, is called the Okie Doke! We are not fooled by you, felon Kerik! Sit. Down. 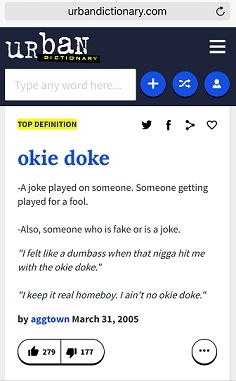 Source Urbandictionary.com Felon on Probation Bernard Kerik doing the Okie Doke thinks he's still the NYPD Commissioner and its damn scary!